This book tour's stops are listed at the bottom of this post, and included are a bunch of cities I haven't visited on any recent tour. Also, I'm not doing a midnight release at BYU this year. Instead, the release will be Tuesday evening in New York at Books of Wonder (see below). I will number copies at the New York release. But since I can't visit every city where my readers live, I like to set up a signing-by-mail so you can still get a signed book. (UPDATE: SOLD OUT!) For this release Weller Book Works is limiting the amount of copies to 200, which I will number (starting at 101). Email should include name, billing address, shipping address if different, phone number, how the book should be signed. WBW will reply with a paypal invoice that can be paid with a paypal account or credit card #. We will respond to orders in the order they were received. Numbers will be assigned when payments are made and will likewise be the order in which they were received. Price is 20% off for prepaid orders. Book total is $14.39 plus tax (if applicable) and shipping/handling charges (if you don't pick it up in the store). Orders must be made and prepaid by May 3 to qualify for discount. Offer good while supplies last (SOLD OUT!) or until May 3. Due to the short timeline for this promotion, we can't guarantee the book's arrival by its release date. Once Weller Book Works runs out of copies (NOW SOLD OUT! ), the next best way to get a signed copy of the book is to contact one of the tour stores and ask them if they can get a copy signed and ship it to you. Many of them will be able to do so. Address: 18 West 18th St.
Notes: Please check back later for information on whether this event is ticketed. Preordering your copy of THE RITHMATIST at this store is a safe bet. Address: 17 Haverford Station Rd. Notes: Free numbered tickets for a place in the signing line will be handed out at 6:00 p.m. Seating for the presentation prior to the signing is limited, and available on a first-come, first-served basis to ticketed customers only. 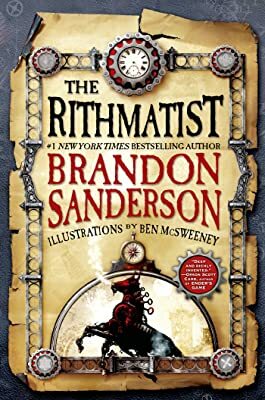 Notes: In order to go through the signing line and meet Brandon Sanderson for book personalization, please purchase THE RITHMATIST from Blue Willow Bookshop. At the time of your purchase, you will receive a signing line ticket that indicates your place in line. Notes: This event may be moved off-site. Check back for updates closer to the event date. Please check back later for information on whether this event is ticketed. Preordering your copy of THE RITHMATIST at this store is a safe bet. Notes: Brandon is a guest. There is a registration cost for entry into the convention. Notes: Check back later for information on whether this event is ticketed. Preordering your copy of THE RITHMATIST at The King's English is a safe bet.